The sewer line is the core of a home’s sewer system, and without it working properly, your home would not have running water that is clean and safe for use. Since your home’s sewer line is hidden and was most likely in place when you got your home, it may not be something that you think about often. However, it’s important to know a bit about how they operate so that you can be prepared to call a plumber in case something goes wrong and you need to get sewer line replacements or repairs. – Pipes may become broken or cracked from shifting soil or deterioration over the years. – Bellied pipe is a pipe that has sunken down in a certain area due to the ground shifting. This becomes an issue because dirty and other debris can settle in one area, leading to clogs and less water pressure. – Sewer pipe joints can come loose resulting in water leaking into surrounding soil. – Overgrown tree or shrub roots can also lead to a damaged sewer line. Further damage can be prevented by removing the trees or implementing other methods to prevent the roots from reaching and cracking pipes. – Poorly installed or faulty pipes can lead to problems down the line. Make sure you call your local plumbers at High Tech Plumbing if you need sewer line replacement due to poor installation or natural causes. If you call a plumber and they determine that the issue is a clogged drain, your plumber may use a drain snake in order to break up the clog. However, this is usually only effective in a branch drain line, whereas, in a main drain, the issue may become a little more complicated. This may require the use of a sewer drain snake through a main clean-out fitting and will require further examination to get to the root of the issue. 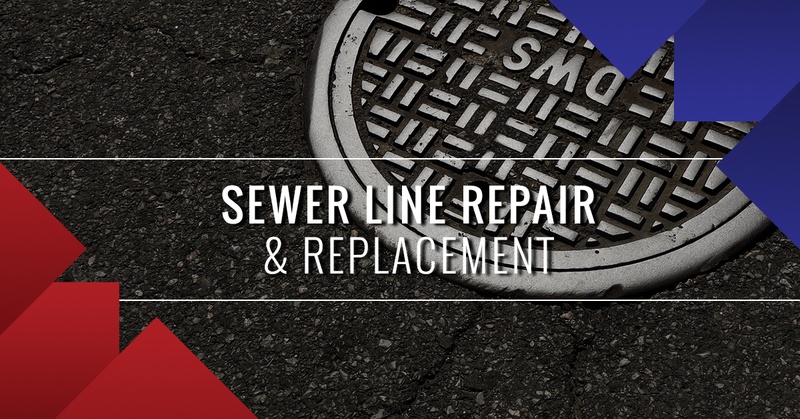 More serious clogs or damaged pipes can call for a sewer line replacement. If you think this is a possibility, call your local plumbers and speak with them about the issues you are having. Your plumber will work with you to create a plan of action and determine whether sewer line replacement is necessary. Sewer line replacement may include anything from pipe replacement to joint replacement and may require removal of soil, rocks, or roots. If you think you may have damaged or clogged pipes, it’s always best to call a professional plumber in order to determine the best course of action. If you’re experiencing issues with your plumbing, it can be any number of issues and it’s not always easy to tell what’s causing it just by examining a fixture like a faucet or toilet. Call High Tech Plumbing today so we can help you decide whether you simply need repairs or a sewer line replacement.